Flax is a filament fiber harvested from flax plants that when made into fabric, is called linen. Flax is the oldest fiber on record, first grown by the Egyptians having along the banks of the Nile. Other sources lay claim to the earliest usage of flax to be in the Stone Age. The term “linen” is often misused, being applied to fabrics that simply look like linen, or being used as a general term for sheets, towels, and tablecloths. Flax fibers are obtained from the stem of the flax plant. The stem consists essentially of a central woody core and a surrounding cortex which contains the flax or bast fibers. The thin cambium layer lies between these regions. The fibers are obtained from the plant in the form of long filaments, each of which is made up of cells. PLANTING: Planted between mid-March and mid-April, the seed takes 100 days to grow and reach 1 meter when it flowers. FLOWERING: Though the Linen flower only lives a few hours atop its supple stem, all flowers in a field do not bloom on the same day; This is what gives the landscape a delicate blue-ish color for a few weeks, moving like an Impressionist sea in the wind. HARVESTING: We don’t reap linen, we pull it up! It is pulled up when the leaves have dropped off the bottom third of the stem. The plants are then placed in swaths of cloth (one – meter wide linen sheets) which give the field a graphic beauty. The capsules holding the seeds take on a brownish-yellow color. RETTING: Sun, dew and rain help detach the fibrous skin from the central wood, the stems take on a beautiful russet hue. Then comes the time for gathering. SCUTCHING: The second phase for mechanically transforming the plant into fibers: to use the linen fibers which surround the central wood-like skin, it is necessary to separate them. COMBING: Combing is the preparation for spinning, a homogenization of fibers into soft, lustrous ribbons like blond hair. SPINNING: The spinning process comprises various operations which make it possible to transform the fibers into yarn. There are two main techniques: thick yarns for decoration are obtained by dry spinning; Fine yarns for clothing and household linen, by “wet” spinning. WEAVING: Who has not dreamed of a linen jacquard? But do you know that linen is also developed in serge, herringbone, glen plaids, double-weaves, velvet, floating yarns, gauze, satin? FINISHING: The ultimate step in fabric processing, finishing includes treatments designed to change the appearance of the yarn or linen fabrics and giving them the values sought by consumers in terms of comfort, aesthetics, functionality. Four categories are distinguished: bleaching, dyeing, printing and finishing. Linen is an ancient fiber. It has been found in ancient tombs and was used in burial shrouds for Egyptian pharaohs. Linen is a bast fiber, meaning it is obtained from the stem of a plant – in this case, the flax plant. 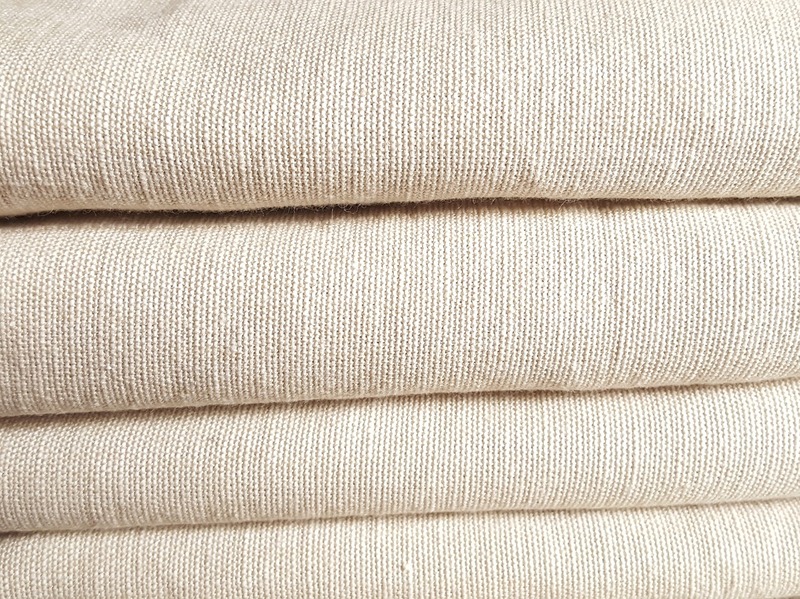 The word linen comes from the Latin name for flax. Flax is planted in spring. In early summer it produces blue flowers and it is harvested in late summer after the plant has reached its full height of 2 to 3 feet. Harvesting flax is mostly done by hand. To preserve the length of the fiber, the entire flax plant is pulled up. In a process called rippling, a machine removes the seeds. These seeds are used for next year’s planting or are used to make other products like linseed oil. The harvested flax is then left in bundles in the field for a few weeks. This process, called retting, helps loosen the fibers from the core of the stalk. Now that the fibers are loosened, the next step is scutching – breaking and beating the flax to remove the woody stalk and bark. The flax fibers are separated into smaller bundles called hands, which are hackled, or combed, and arranged into ribbons of long fibers. Linen fibers are six to twenty inches long. This length makes linen fabric strong and smooth. The fibers are woven into the fabric, then finished by bleaching, dying, or printing. Linen shares many of the advantages of cotton. It is strong yet comfortable to wear in warm weather. It is so often used for bed coverings that we call them simply – linens. It’s also used in handkerchiefs, and fine fashions – everything from dresses to suits. Linen is especially popular for suits worn in tropical climates. It is also found in wall coverings, drapery, and upholstery fabric. Linen is more expensive than cotton and high-quality linen is considered a luxury fabric. Linen is ideal for lightweight suits, table and bedclothes, and furnishings.